One of the most entertaining video channels on YOUTUBE covering the golden years of cinema and theatre music. 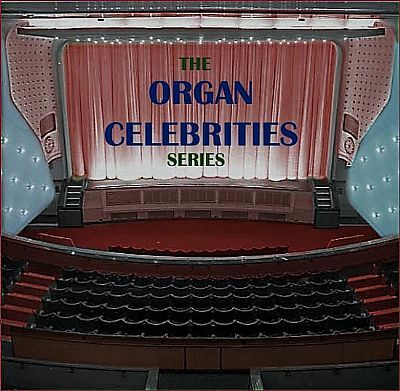 Take a trip down memory lane with the ORGAN CELEBRITIES series of YOUTUBE videos produced for organ enthusiasts by an organ enthusiast! This website shows what can be done with a little digital magic and some secrets with startling revelations from years gone by. You may be surprised how effective it is. UNLESS OTHERWISE STATED YOU CAN ACCESS ALL THESE SUPERB VIDEOS DIRECT FROM THESE PAGES. ALTERNATIVLY GO DIRECT TO YOU TUBE OR GOOGLE AND TYPE IN THE GENERIC TITLE 'ORGAN CELEBRITIES' FOLLOWED BY THE NAME OF THE ARTIST..
Then sit back and enjoy some of the brightest and most informative organist tributes on the Internet. KLAUS WUNDERLICH (ORGAN CELEBRITIES VIDEO 23) HAS PASSED THE 100 THOUSAND HIT MARK SINCE BEING UPLOADED TO YOU-TUBE IN 2010. HAVE YOU SEEN IT YET? You will be able to enjoy special photos / unique record sleeves and private videos that are not available elsewhere. In July 2015 a new video was added showing all his 14 Gold Awards. This is the first time anywhere in the world that this collection has ever been seen. When this recording was made, at the time of his 80th Birthday, it could not have been known that it would be the very last full length radio interview he would give. This is the first time the interview its been heard since the initial broadcast, and it has been enhanced with rare recordings, photos and Birthday greetings from celebrity organists of that time. This is MR BLACKPOOL in his own words & music. Nearly 30 years ago a private demonstration of a very famous organ, resulted in the demonstrator being offered the position of organist for what has become a ‘must go’ attraction in the City of Liverpool. The series of Classic Film Night presentations at the Liverpool Philharmonic Hall feature the City’s own DAVE NICHOLAS playing the Rushworth & Dreaper organ at every performance. Many years earlier Dave was employed in the Music Department of the iconic Rushworth & Dreaper Music Store, and even before that was employed at various Holiday Camps owned by the famous Billy Butlin. For someone who was born and lived opposite the Plaza Cinema in Birkenhead, his interest in the world of cinema organs was the catalyst that saw him being tutored by two of Liverpool’s famous cinema organ world names, Ian Hamilton & Frank Gordon. The musical history behind DAVE NICHOLAS, the diminutive fun loving character, is told in the latest You-Tube video in the Pedal, Percussion & Pipes series: the music being taken from a live concert recording he gave during the 70s at the Playhouse Theatre, Hulme, Manchester on the WurliTzer (then) the BBC theatre organ. This video contains the only known full length example of the famous Walturdaw rising screen: a giant 7 ton example of cinematograph history which is the only one of its kind in the world still in full working order. An added musical bonus are a series of personal photographs, presented with the sounds of the Rushworth & Dreaper organ. Back in the 80s I presented a series of live concerts at the BBC Playhouse in Manchester featuring artists playing the BBC WurliTzer theatre organ, and also on electronic of their own choice. One of the first was Keith Beckingham and the full concert can now be heard, together with photos and additional information on the new website. When this famous organist passed away, also in January 2016, I decided to upload the two complete halves of a concert at the same venue, as a tribute to his amazing skill and artistry at the theatre pipe organ and electronic organ...often both at the same time as you will hear in this live concert from the early 80s. Another visit to the famous BBC Playhouse in Manchester to enjoy the former BBC Theatre Organ No 3 in the hands of Boltons own Happy Wanderer RONALD CURTIS. This is a live concert recorded during the 80s for the long running BBC Radio Manchester series PEDAL, PERCUSSION & PIPES. You will note from our Menu listing that we have do not have a dedicated NEWS page. This is because news is left to the websites who deal with it - see Keyboard News & Chat in Menu. However, there is nothing stopping you writing to our GUESTBOOK as someone has already done. Your letter will be published if it considered in anyway relevant to the nature of this website. Regrettably, it is not normally possible to include news of forthcoming events on the Organ1st Radio programme - please see the full explanation in FAQs. Television of the future. Sony have started to produce television sets that connect to the Internet, and hence YOUTUBE. Other manufacturers will surely follow. This means that sometime in the future you will be able to see the Gram-r-fone video channel on the bigger screen of your TV set. CD Albums available Links have been added to players with albums available at Organ1st MSS Studio. The albums may, or may not, have tracks of the ones played on the YOUTUBE video - so it would be wise to look at the album's playlist on the Organ1st website. The content on this website is given or displayed in good faith. With reference to any photos it must be assumed that they are Copyright and therefore not to be downloaded without permission. In all cases where known, the Copyright owner will be shown. Should you wish to lay claim to any un-credited photos please contact us and we will either remove them or offer credit of your own wording. If there are any issues or inaccuracies we will be pleased to deal with them. Please note that GRAM-R-FONE is not responsible for the advertisements that appear on this website and do not endorse them in any way.